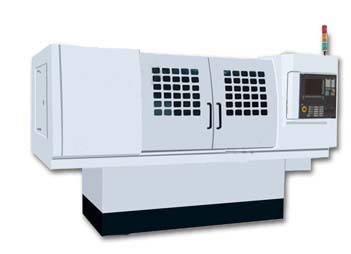 ★The machine tool lathe bed adopts casting pieces, deformation small, rigid good. ★The machine parameter setting, modification using touch screen form, which can realize the man-machine dialogue. ★All moving machine tool guide rail USES the linear rolling guide rail, sliding and feed reciprocating screw adopts high accuracy ball screw. ★The machine tool feed system and reciprocating system all use Japan mitsubishi servo system two axes linkage control. ★The machine tool spindle adopts high-speed motorized spindle,and controlled by the static frequency converter, realize stepless speed regulation. ★The bedside box adopts high accuracy ball bearing, rotating speed of communication is frequent, stepless speed regulation. ★The machine can match three jaw chuck, hydraulic chuck, chuck, film pneumatic chuck clamp for user selection, etc. ★The machine adopts closed cover shell, beautiful appearance generous.